Berry dogs gets their name from the berry bushes they call home. When they were first discovered several hundred years ago, they had only started to grow green-ish colored fur to blend in with the berry bushes. 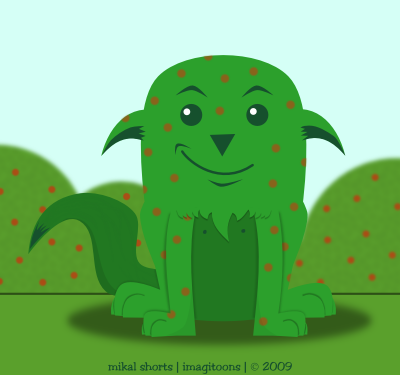 As you can see, berry dogs are now fully green and have even grown berry like spots in their fur. This often leads visitors to our zoo to believe that their isn't a berry dog in the exhibit when in fact there are several! Berry dogs can be very territorial over the bushes that they inhabit. Here you can see we have red berry dogs but there are berry dogs for just about any color of berry there is. This is one of the few animals that lives throughout the world - if you've got berries, you've probably got berry dogs somewhere! Ooh, it looks like one of our most obscure mammals is next!